The Polar Premier is our newest halogenerator. It incorporates new advanced design with both plastic and stainless steel parts. Polar Premier has a controller which allows you to adjust the treatment settings and can provide correct salt concentration up to room sizes of 400 sq ft. If you want to enjoy halotherapy in your own home – or office – the Personal Salt Generator is for you. It creates the same dry saline aerosol environment as the floor and wall-mounted models – but just for you! 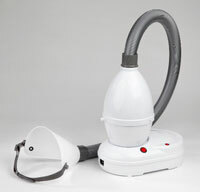 Halogenerator is the heart of Halotherapy. Halogenerator creates the dry saline aerosol environment in the saltroom. Polar Wellness model is ideal for new saltrooms. Wellness offers controls for saltroom lighting, exhaust fan and optional control features such as salt lamps, window art etc. Unlike other generators on the market, our halogenerators NEVER clog. You’ll get clean, dry saline aerosol every time you turn it on. No problem. It is ESSENTIAL that you put the highest quality salt into your halogenerator. Respitory Salt is the pure medical grade salt used in the Saltroom Halogenerators. This salt is dispersed as dry saline aerosol into the Saltroom by the Halogenerator. Respitory Salt is sold in bulk with a dispenser scoop. Halo Generator is the heart of Halotherapy. Halo Generator creates the dry saline aerosol environment in the Saltroom. The floor model is ideal for existing Saltrooms without a Halo Generator. The floor model creates the same dry saline aerosol environment as the wall mounted model, but lacks the control features of the built-in wall mounted model. The Pet Salt Generator is a great way to alleviate your pet’s respiratory problems. It can be used at home, or as part of a veterinary clinic or pet hotel. Often used at horse stables, it’s especially popular in the horse racing and camel racing circuits. For large animals like horses and camels, the Pet Salt Generator has an egress scoop which is secured in front of the animal’s muzzle. When treating dogs or cats, the egress scoop can be placed in front of the pet kennel (crate) door. Simply cover the rest of the kennel with a towel in order to create the dry saline aerosol environment for your pet inside the kennel.